A simple, mildly spiced curry that will appeal to all ages. Cut everything into bite-sized chunks for easy eating with a fork, so it can be enjoyed while watching the fireworks. Heat the oil in a large pan, add the onion and fry for about 7-8 minutes, until lightly browned. Add the chicken and fry briefly to seal. Stir in the curry paste until the chicken is thoroughly coated, then add 750ml hot water from the kettle and return to the boil, stirring. 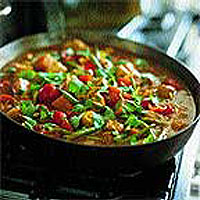 Reduce the heat, cover the pan and allow to simmer for 10 minutes. Add the sweet potatoes and green beans and simmer for a further 15 minutes, or until the vegetables are tender and the chicken is thoroughly cooked. Taste and season.